On Monday, Dan Robbins who helped popularize the paint by number genre died at the age of 93. In the early 50s, working for Max Klein at the Palmer Paint Company, he helped create a national craze. I’m a full-time artist and writer and my work uses vintage paint by number paintings, of which I have some 3000. Over the last 25+ years I’ve accumulated a wealth of knowledge on the subject, and I have LOTS of research material as well, maybe more than anyone on the planet. And I owe much to Dan Robbins and the incredible vintage paint by numbers he created and supervised in the early 50s. I salute the man and his work! In 2001, (at my suggestion, btw) the Smithsonian Museum of American Art mounted a year-long retrospective and borrowed 20 plus paintings from the collection of 200 paintings I originally inherited from the late SNL originator, Michael O’Donoghue. 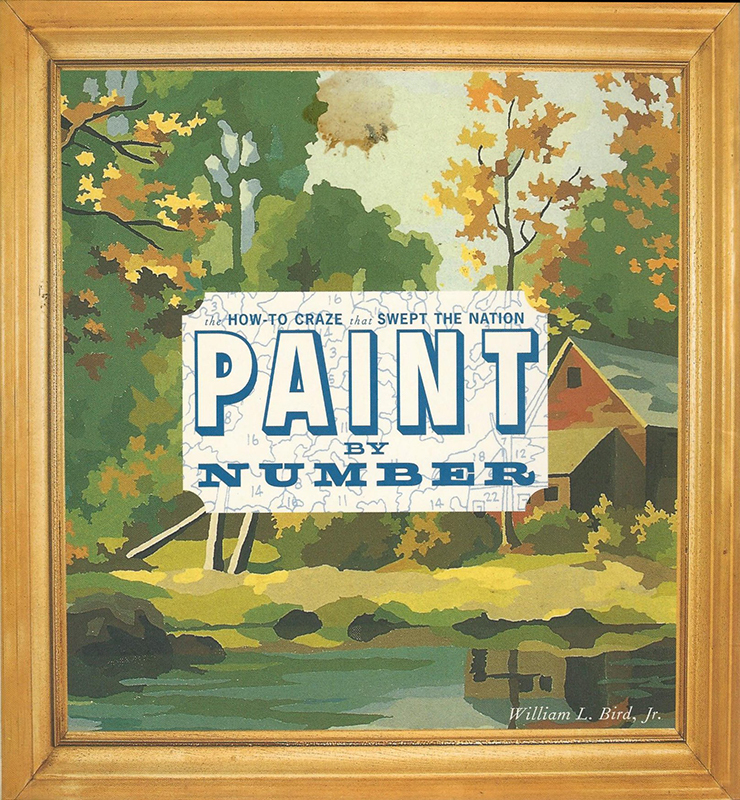 Robbins writes in his book that he had the idea for paint by number kits in late ’49, early 1950. He may have had the idea then, but he wasn’t the first. Exhibited in the Smithsonian show and in the catalogue was a painting produced by Picture Craft, Columbia Jay, on canvas, which I own and illustrate in my book, Transform Your Life with Color By Number (Regan Arts, 2016) It is dated and copyrighted 1949. The cover of the catalogue to the 2001 Smithsonian exhibit. This new info didn’t fit the narrative of the story they had in mind. She later wrote to say she spoke with ex-Smithsonian curator Larry Bird, and didn’t refer to Robbins as the “inventor” of the genre. I returned NPR’s Elizabeth Blair‘s call, and I later heard back and she wanted some info from me via email, but it was too late. Like CNN, ABC News, NBC News, The Guardian, the Los Angeles Times, The New York Times and a host of others, the NPR story, contained similar info, but stopped short of calling Robbins the creator of the first paint by number. Robbins was a legend in the world of paint by number and will be remembered fondly as such. He created THE most collectible kits ever, Queen Elizabeth II and the Braque-inspired still-life, Abstract No. 1 that he showed to Max Klein to sell him on the idea ask well as scores of others. He was already assured a place in American history, creator or not. Well, one thing I’ve learned through this and other stories I’ve been intimately involved with, history is often wrong. There are scores of pieces over the years saying Robbins created the first paint by number, as well as a Wikipedia page that people will no doubt use to research and repeat this as fact. Over all the years, not one interviewer did their research and asked him if there were manufactured kits prior to Craft House’s? Apparently not. Andy Warhol is the most famous and popular pop artist in history, but he didn’t “invent” pop art and 100 headlines saying that he did, won’t make it so. But if we’ve learned one thing from the age of Trump it is this –repeat a story again and again and again. It WILL become the truth, if there’s no one to refute it. And even then, the most press still wins. Below is a segment CBS Sunday Morning‘s Bill Geist did on the Smithsonian exhibit in 2001 where you’ll see the show and Robbins himself talk about his involvement in the craze he helped create. There’s also a visit to my Brooklyn brownstone and a short tour of my collection at the time. RIP, Mr. Robbins. You created SOME life, inventor or not.